Update: Entries are now closed and the winner has been contacted. Check out the Giveaways page for our current prize! Update 2: The winner has been announced. The Joker giveaway is over! Good luck to everyone who entered! I’ll be announcing the winner during a site update post this weekend. Lets go Marvel this time! The site is still heavily tilted towards DC, but it won’t be forever, dear readers! 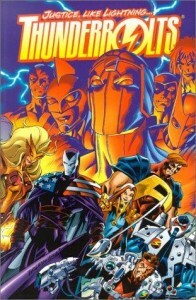 Today’s book is the paperback collection of Thunderbolts: Justice Like Lightning! By Kurt Busiek and Mark Bagley, it’s a hefty piece of Marvel history, collecting the first four issues of Thunderbolts, the team’s first appearance in Hulk, and issues of Tales Of The Marvel Universe Special, Spider-Man Team Up, and the Thunderbolts ’97 Annual. If you’re looking to get into the excellent Warren Ellis run on Thunderbolts, this is a great companion volume. (1) Winner – Randomly selected from the comments on this post. You must be logged in when you comment to be eligible. You must also be in the continental USA. Deadline – You have until 11:59 on Friday, November 12th, 2010. The winner will be contacted that night or early the next morning, and announcement will be made as soon as they are confirmed. The Thunderbolts have always been one of my favorite teams. The concept is just phenomenal and the reveal is definitely one of the greatest moments in comic book history. I’m glad you’re going Marvel this time, which is hopefully a sign of things to come! Good luck to everyone! Wow, cool offering. Good luck folks. I didn’t get into Thunderbolts until I read through the Civil War event followed by Secret Invasion. In fact, I hadn’t even heard of them until I was “forced” to read a few issues because they were tie-ins. And I have always been amazed at their popularity. It would be awesome to read about their beginnings. I think that may have been where I caught on as well. When I was starting to get into comics again I read all of civil war and house of m as my marvel intro. Thunderbolts has been one of my favorite comics for a while. It’s given relatively minor evil characters a chance to change and it’s really shined for a few characters like Songbird and Moonstone and Ghost. Is it still running strong? I read the two Ellis volumes and enjoyed them a lot, but wasn’t sure what to get after that. Man every time I go looking for something new to read recently, someone says something praising of Warren Ellis. I think I’m just gonna use that as my guideline. Was his take on the Thunderbolts significantly different than the beginning stuff? haha, he’s a good writer and he’s stuck his fingers in a lot of pies. It’s hard to avoid him. Definitely darker, funny in different ways, but also just because it’s more in that modern way. I don’t know, both books seemed to be good examples of the time they were written. Well, Ian, it depends on what you think of as “running strong.” The book tells some good stories, but has gone through like 5 direction changes in the last two years. The current direction is pretty good, with Luke Cage rehabilitating the ‘Bolts on the Raft. Kev Walker’s art is a very good fit for the title, too. I don’t even know what the Raft is, so maybe I have some catching up to do first. I was mainly interested in the Norman Osbourne plotline, but I think that became Seige? Or Dark Reign? Like I said, I need to catch up. Have you never read Bendis’s first arc on New Avengers? If so, I’m not sure how you don’t remember the Raft. If not, read it! While it isn’t the best from Bendis, it is one of the seminal stories of the last 5-10 years at Marvel. The Osborn thing came out of Secret Invasion and became Dark Reign. He used the team as a personal hit squad basically, with a quasi-rotating cast. That ended with Siege, where Stormin’ Norman fell from power. The Thunderbolts were then restarted by Steve Rogers, current top cop of the MU. Boy, do I feel like a recap page! I only read secret invasion where it hit she-hulk and runaways, I’m not caught up with that either, haha. I’m interested to see how you’ll like the modern Avengers stories. I wonder how long it’ll take you to get caught up. I actually recently got New Avengers Vol. 1 as part of a 75 book box of trades (a bunch I got just for giveaways). Do you think I’d be able to jump right in? haha, it’s too bad the Marvel section isn’t finished or I’d be able to answer my own question! Never heard of this one before. Anybody have a review they’d like to share on it? I got into Thunderbolts around Civil War and could only find the trades back to the beginning of the New Thunderbolts run. That makes this particular giveaway even more exciting. Btw, I noticed you lost/changed your password a couple times today. Is everything working well for you now? Yeah. For some reason, my go-to password that I know I used here wasn’t working, so I reset it and then changed it back to what it originally was. All is good now, though! Great! Feel free to let me know if you run into any other problems, but it’s good to hear that the automated system helped you handle it. Bagley? Yes, please, I deserve to win! I honestly didn’t realize this was him until I pulled this trade out again. I’m familiar with his work on ultimate spider-man, of course. Wow, I had forgotten Busiek and Bagley did this. No wonder the original run was such a classic. I actually forgot myself, until I picked up the book to type up this post!